In the month of November I had the opportunity to enjoy ten days of scuba diving in Monterey and Carmel. The weather and conditions varied greatly over that period, as did my role as a diver. I played the part of instructor, training buddy, and videographer for a tech-diving class. The dives ranged from shallow, interesting shore dives to deeper and more challenging adventures from a boat. As much as I enjoy sharing these adventures with wonderful buddies, my main motivation for engaging in cold water diving is the diversity and magic of the marine life we encounter in Northern California. The highlights of the month were: the abundance of octopi in Monterey Bay, the kelp crab who settled on top of a student’s head during drills, a frisky sea otter who refused to move from his perch atop a dive float, the four molas who joined us on a decompression stop, and the Risso dolphins who allowed several blissful in-water encounters in the open ocean. All of these amazing creatures deserve special recognition, however the octopus in particular piqued my interest and captured my imagination as a sacred messenger. We are usually excited to find a single octopus on a dive, but at certain times during their reproductive cycle they are present and visible in large numbers. This was one of those times, and we were fortunate to see between 6 and 12 octopi on every dive in Monterey Bay. There are many symbolic, spiritual, and energetic meanings for the Octopus. She is truly one of the most intelligent, powerful, versatile, and fascinating animals on the planet. It is said that Octopus participates in the Universe on multiple levels. Her unlimited supply of remarkable attributes makes it impossible to describe the full spectrum of her symbolic representation. Therefore I’m going to focus on the insights that have the most heart and meaning for me. Much of the symbolism of the octopus is inspired by her sheer physical presence. Her body is powerful; she is seemingly soft but incredibly strong. The octopus is a cephalopod mollusc. She has a bulbous head, two distinctive eyes, and four pairs of arms. Like other cephalopods, she is bilaterally symmetric, perfectly balanced with her left and right sides forming a mirrored reflection of themselves. The octopus has a hard beak, and her mouth is situated at the center point of her body where her arms converge. Her eight arms extend from a circular central body, bringing to mind the concept of a spiral. The spiral is a globally positive symbol considered to represent the evolutionary process of learning, growth, and expansion. The spiral can also represent a spiritual journey. Octopi are invertebrates, meaning that they do not have a structured spinal column. As a result, they are able to slip in and out of very tight places, literally disappearing from sight as though by magic. Their movement is more fluid, beautiful, and mesmerizing than an intricately choreographed dance. In a very real sense, octopi can ambulate as if they are the embodiment of water itself. Their remarkable fluidity of motion is symbolic of agility, grace and flexibility. Octopus teaches us that we may move towards our goals in unorthodox ways to achieve our desired (or better) results. She also reminds us to loosen up, relax, and go with the flow. The octopus can detach any of her 8 limbs at will to distract predators. Like the octopus, we have the ability to release distractions, emotional baggage, or old patterns from our lives. We can lighten our load and free our energy to use in exciting, productive ways to achieve our highest good. The octopus is able to regenerate her discarded limbs. This ability reminds us that even as we release old ways of being from our lives, our essence is never lost to us. Our experiences give shape to our personality as we proceed along our path in life. We are the sum of our experiences, including those parts we decide to consciously set aside. We achieve a greater state of health and wholeness by accepting all aspects of ourselves as we implement newly refined ways of being. Octopus is a bottom dwelling animal who hides in cervices during the day and hunts at night. For those to whom she is a totem, working in alignment with nocturnal energies and rhythms may result in heightened levels of productivity. Octopi are among the most clever and intelligent creatures in the animal world. They possess a remarkably well-developed brain and nervous system, and they have extraordinary vision. Octopi can distinguish different colors by their light sensitivities. Their eyes can also adapt to rapid changes in light as they move from deeper depths to the surface. While in captivity, octopi have demonstrated the ability to reason, strategize, and recall information. They can easily learn to discern shapes, remember events, and carry out tasks in imaginative ways. Octopus reminds us to use our logic and reasoning skills to our highest advantage. She urges us to be the master of our intelligence, not a slave to our mental habits. The octopus has mastered the art of camouflage as a brilliant means of survival. She can change her color to blend seamlessly into her environment in the blink of an eye. Simultaneously, she is able to manipulate her physical body to mimic the texture of the surrounding terrain. As a master of disguise, octopus embodies the symbolic qualities of mystery, secretiveness, and esoteric knowledge. Octopus uses stealth and intelligence to capture her prey. In doing so she illustrates the value of being stealthy and intelligent about our own endeavors, teaching us that at times we are wise to camouflage our activities in order to succeed and thrive. From a broad spiritual perspective, octopus is reflective of the mystic center and the unfolding of creation. Her eight arms spiral outward in a metaphoric display of creative expansion. Creation is born from a balance between expansive freedom and working within an established parameter. The magical and mysterious octopus perfectly illustrates this balance. The number of her arms is significant, as eight represents harmony and balance. In traditional numerology, eight symbolizes abundance, personal power, and authority. It is also the number of Karma, the Universal Law of cause and effect. According to kabbalistic teachings, the number seven symbolizes perfection that is achievable through natural means, while eight represents that which is beyond nature and its inherently limited perfection. Although vastly mobile and an adept underwater traveler, the octopus is primarily a bottom dweller. In symbolic terms this is analogous of being grounded while still having the ability to exist in the watery world of the psyche. Octopus reminds us that while we may be spiritually and intuitively gifted, we are physical beings and must temper our psychic gifts with strong foundational grounding. The female octopus can lay as many as 150,000 eggs. Mother octopus awakens us to our creative potential and inspires us to explore the many different ways we can express our creativity. Mother octopus does not leave her nest during the 4 – 6 weeks required for her eggs to hatch. She neglects to eat while guarding her eggs, and eventually starves to death during this period. In this way Octopus serves as a strict reminder to take care of ourselves while balancing our work obligations. We should avoid immersing ourselves so deeply in our tasks that we forget to take care of ourselves. The octopus shares many attributes with the element of water, including the characteristics of fluidity, penetration, and movement. She moves skillfully and gracefully in an aquatic realm that is in constant motion. Water instantaneously assumes the form in which it is held, similar to how the octopus blends and contorts to fit into her environment. These qualities are symbolic of flexibility, adaptability, and creativity. Elemental Water is regarded as a feminine aspect of the source of life. Like Water, the octopus is ever changing and shifting in accordance with her environment and the magnetic pull of the moon. The moon is a representation of the Divine Feminine and is associated with the psyche, intuition, and emotions. Octopus is also attributed with these associations. I have felt blessed to have shared time in the water with this magnificent creature. Her complexity, grace, and wisdom have provided inspiration for my ongoing processes of growth and expansion. I look forward to meeting her again during future diving adventures. In the meantime, thank you Amazing Octopus Spirit! The octopus is a strange-looking creature that gracefully and almost eerily moves throughout the sea. The odd physical composition as well as its unique behavior have earned this creature an endless list of spiritual attributes that we can call upon in our daily lives. 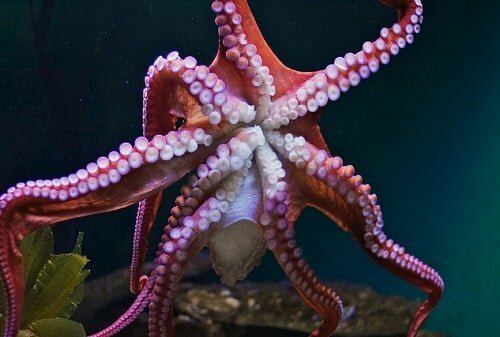 Like other water-dwelling creatures, the octopus animal totem symbolizes purity, emotional, psychic and creativity. The octopus spirit guide is also known to be symbolic of a keen spiritual psyche and inspires others to channel theirs. Fittingly, this creature also symbolizes the flexibility that is necessary to our lives. Its physical characteristics play a large role in how we interpret their spiritual significance. As invertebrates, they are not limited by a spinal column, allowing them to move with much more agility than humans. Their movements symbolize grace and flexibility as they peruse the sea floor skillfully and without strain, just like flowing water. The water that houses the octopus also denotes flexibility in that it takes the shape of whatever vessel is containing it. It implores us to exercise such flexibility and adaptability in our own lives. As a spiritual totem, this creature wants us to loosen up and relax sometimes, keeping our eyes on the end goal while moving along our path in a more natural way. Just as the octopus lives in an environment that is in constant motion, so, too, do humans. Our world is shifting and ever-changing and we must act accordingly to move along with it while remaining on our desired path. As a spiritual guide, the octopus acts as a symbol of more things than most. In addition to the above mentioned traits, it has a lengthy list of attributes to help guide our hearts and minds: free will, focus, strategy, potential, logic and reason, defense, insatiability, knowing, complexity, and unnerving unpredictability, just to name a few. They are highly intelligent, strategic beings who utilize their secrecy to survive and thrive. Spiritually, octopus meanings symbolize great energetic depths and offer a plethora of lessons to those willing to learn. They are born and live at the sea floor, symbolizing the necessity of being grounded in our lives. Although we each possess special gifts, we cannot allow ourselves to become aloof. Furthermore, the octopus animal totem reminds us to remember our foundations as we continue to move about and explore the world. The octopus is a regenerative creature, meaning that it can detach an appendage if need be. This defensive tactic allows them to escape predators and other potentially harmful situations. For us, this serves as a reminder to cut excess baggage loose. Maybe there is a person in your life who is leeching off of you, but you are too kind or too nervous to send them off. The octopus spirit guide reminds us that we must take care of ourselves and not allow people to take advantage of us or bring us down. This applies not only to people but to situations and tasks, too. If something is distressing to you and not helping you to achieve your goals, you must have the strength and will power to set it free. This can be a scary process, especially if you are releasing something that has previously been fundamental to your life. The regenerative properties of the octopus remind us that all is never lost. Things that should or need to grow back will do so naturally. Letting go is an exercise in acceptance and forgiveness, albeit one of the most difficult ones. In this way, the octopus is particularly helpful to us during dark and desperate times of need, such as with addiction or abuse. If we allow ourselves to be guided by the principle ofregeneration, our journey through difficulty will seem less intimidating. The octopus symbolism is also known to facilitate very emotional dreams. In these states, the dreamer may experience a roller coaster of ups and downs, but the octopus is there to assist in healing. By working through these difficult feelings, you are cleansing yourself and enabling unadulterated happiness and peace of mind.